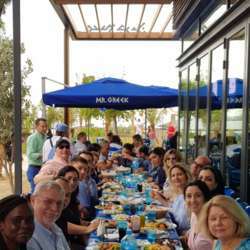 You must be a member of the Dubai Lunch & Brunch Group to attend this activity. Would you like to join this group? Make every day a culinary celebration with these authentic and healthy Mediterranean recipes. With the freshest of premium ingredients enjoy the best of Greek cuisine here along with the famous Greek hospitality to get a complete Mediterranean experience. The Mediterranean Diet is among the oldest and healthiest diets in the world ...The Mediterranean diet which demands the use of fresh ingredients, emphasizes the use of olive oil when food is fire-grilled. Doesn't contain MSG or tenderizers and the oil used is trans fat free. Greek Salad Iceberg and romaine lettuce mixed with radicchio, red onion and Mr. Greek dressing topped with Kalamata olives, cucumber, tomato, fresh oregano & feta. *Grilled Calamari Tender: , grilled and served with sautéed peppers and onions. Drizzled with olive oil and fresh garlic Lemon. Served with two sides of your choice and Tzatziki dip. Any extras will be paid separately!! A day, a place, and a taste you don't want to miss!! !